To Cite: Mohammadalipour Z, Rahmati M, Khataee A, Moosavi M A. Different Concentrations of Titanium Dioxide Nanoparticles Induce Autophagy Followed by Growth Inhibition or Cell Death in A375 Melanoma Cells, J Skin Stem Cell. 2017 ; 4(2):e63994. doi: 10.5812/jssc.63994. Dysregulation of autophagy is currently known as a contributing factor to tumorigenesis. Accordingly, exploring novel compounds with autophagy - modulating properties is a priority in cancer research. While a number of synthetic compounds have been developed, autophagy - modulating Nanoparticles (NPs), such as titanium dioxide (TiO2), have been recently considered. This research investigated the effects of a well - dispersed form of TiO2 NPs on autophagic vesicle formation in human melanoma A375 cells. The cells were treated with different concentrations of TiO2 NPs (1 - 100 µg/mL) for 24 hours, then growth, cell death, and autophagy were, respectively, evaluated by trypan blue exclusion test, MTT assay, and acridine orange staining. The results showed that well - dispersed TiO2 NPs induced growth inhibition in a dose dependent manner, while cell death was only observed at high concentrations (100 µg/mL). In addition, a significant increase in Acidic Vesicular Organelles (AVO) formation was detected at all concentrations of NPs after 24 hours, suggesting that TiO2 NPs may induce both cytostatic and cytotoxic autophagic responses, depending on the concentration. Melanoma is the most common and aggressive form of skin cancer with significant mortality and survival rate of 10% (1). Current treatment options for melanoma include surgery, chemotherapy, immunotherapy, bio - chemotherapy (a combination of immunotherapy and chemotherapy), and targeted therapy (2). However, these therapies are not effective against all patients and thus, it is important to develop new therapeutic strategies for improving treatment options for patients with skin cancer. Autophagy is a catabolic process that helps sustain cell survival under stressful conditions, such as starvation and nutrient deprivation, through the degradation and recycling of cargo (biomacromolecules and organelles) in a lysosomal - dependent manner (3). However, if stress cannot be resolved, autophagy shifts toward cell death responses. Although preliminary reports have suggested that autophagy acts as a tumor suppressor mechanism at early steps of tumorigenesis, it can also promote survival of established tumors during later stages as well as in response to chemotherapy (4, 5). Obviously, targeting the autophagy pathway may be exploited as a novel therapeutic strategy for cancer therapy. Nanoparticles (NPs), particles with one dimension between 1 to 100 nanometers, are currently used in drug delivery, diagnostics, bio - imaging, and cancer therapeutic strategies (6). Titanium dioxide (TiO2) is one of the most promising NPs with an inhibitory effect on tumor growth (7, 8). Furthermore, TiO2 NPs possess unique properties, including high chemical stability, oxidation capability, and low - toxicity (9). These metal - oxide NPs interact with different components of cells (e.g. proteins, DNA, and lipids) and ultimately modulate cell fate, mostly via DNA damage induction or Reactive Oxygen Species (ROS) production (10). The mechanism by which TiO2 NPs kills cancerous cells is through apoptosis or necrosis induction (11-13). In addition, several recent studies have suggested that TiO2 NPs could induce autophagy in different types of cells, including leukemia cells (14), HaCat cells (7), podocytes (15), and lung cells (16). However, the impact of size, disparity, and concentrations of TiO2 NPs in different cancer models and particularly in melanoma cells need to be addressed further. In this study, the researchers investigated anti - cancer and autophagic effects of different concentrations of the well - dispersed form of TiO2 NPs in human melanoma A375 cells. TiO2 NPs were purchased from Cosmo Chemical Co. (Incheon, South Korea). For cell culture application, they were autoclaved and the stock suspensions (1 mg/mL) were prepared in RPMI - 1640 medium. For cell exposure, stock suspensions of NPs were sonicated and freshly diluted in different RPMI medium. Well - dispersed NPs were prepared by adding 10% (v/v) FBS, as mentioned elsewhere (14). Melanoma A375 cancer cell line was purchased from National Cell Bank of Iran (Pasteur Institute, Tehran, Iran). Cells were cultured in a humidified incubator at 37ºC and 5% CO2. RPMI - 1640 medium (Biosera) supplemented with 10% Fetal Bovine Serum (FBS), 1% penicillin, and 1% streptomycin was used for cell culture. The morphological changes of the melanoma cell line were evaluated using an inverted light microscope (Olympus, Japan) after 24 hours of treatment. Cell growth was assayed by trypan blue exclusion test. Briefly, cells were treated with different concentrations (1, 10 and 100 µg/mL) of TiO2 NPs for 24 hours, and cells were then harvested by trypsinization and stained by trypan blue and counted by a hemocytometer slide under light microscopy (Zeiss, Germany). For cytotoxicity, the MTT (3- (4,5- dimethylthiazol- 2- yl)- 2,5- diphenyl - tetrazolium bromide) method was used. 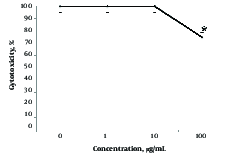 Cells were treated with different concentrations of NPs (0, 1, 10 and 100 µg/mL) for 24 hours. Next, 10 µL of MTT (5 mg/mL) solution was added to the cells and incubated at 37°C for two to four hours. The supernatant was discarded and 100 µL of DMSO was added to the dissolved formazan product. The absorbance was measured by the Enzyme Linked Immunosorbent Assay (ELISA) reader at 580 nm (Thermo/LabSystems Multiskan, USA). Percentage of cell growth was calculated as mentioned elsewhere (17). Formation of acidic vesicular organelles (AVOs) during autophagy has been considered as a critical autophagy marker (18). Fluorescent Acridine Orange (AO) dye stains the cytoplasm with bright green colors and acidic compartments, such as AVOs, as orange/red colors. Following treatment of A375 cells with different concentrations of NPs for 24 hours, they were harvested and stained with AO (10 μg/mL) in a dark space. The images were captured and analyzed with a fluorescence microscope (ZEISS, Germany). Total RNAs were extracted using the RNX plus kit (Cinaclon Co, Tehran, Iran). An amount of 1 µg RNA from each sample was incubated with DNase enzyme (RNasefree) and Oligo dT primers (Fermentase), then converted to cDNA during the Reverse Transcription (RT) reaction by the RT enzyme (Fermentas). The q - PCR was performed using SYBR Green by Rotor - Gene 6000 machine (Applied Biosystems, USA). The primer sequences were: ATG5 (Forward: 3’AGGAACTCACAGCTCCATTAC5’ and Reverse: 3’AATGGCTCCTCTCCTGAGTT5’). A sequence of actin has been reported elsewhere (18). The fold expression ratio was calculated by the comparative Ct (ΔΔCt) method and the results were normalized to actin. The data are expressed as the mean ± Standard Deviation (SD) for at least three independent experiments, each being performed in triplicates. Differences were statistically analyzed by student’s t - test using Microsoft Excel 2013 (Microsoft, Washington, USA), and p < 0.05 was considered as statistically significant. The effect of well - dispersed TiO2 NPs on cell morphology changes was studied by an inverted light microscope (Figure 1). The results showed NPs at low concentrations (1 µg/mL) had no detectable effects on the morphology of A375 cells (Figure 1). However, cells shrinking, nuclear condensation, and fragmentation as well as and cell debris were detected at higher concentrations (100 µg/mL) of TiO2 NPs, suggesting that a cell death response may occur at high concentrations. Figure 1. Morphological study of A375 cells exposed to TiO2 NPs. Cells were treated with different concentrations of TiO2 NPs (1 - 100 μg/mL) for 24 hours and morphological changes were studied by an inverted light microscope (magnification 32X). To better understand the effects of different concentrations of NP, the researchers studied the effects of TiO2 on growth and cell death in A375 cells (Figures 2 and 3). As depicted from Figure 2, well - dispersed TiO2 NPs inhibited the growth of cells in a dose - dependent manner after 24 hours (Figure 2). For instance, TiO2 NPs at 1, 10, and 100 µg/mL concentrations inhibited growth by 8%, 18%, and 47%, respectively. 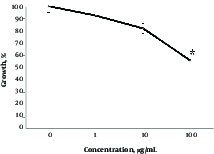 However, effects of NPs on cell death was somewhat different and detected only at high concentrations (Figure 3). Indeed, in agreement with morphological results (Figure 1), a cytotoxic effect was recorded at 100 µg/mL of TiO2 NP and lower concentrations of NP had no effect on viability in the A375 cells (Figure 3). Figure 2. Effects of TiO2 NPs on the growth of A375 cells. Cells were treated with different concentrations of TiO2 NPs (1 - 100 μg/mL) for 24 hours, then growth inhibition was studied by trypan blue exclusion assay as mentioned in materials and methods. Data are means ± SD. Star indicates statistically significant data (P < 0.05). Figure 3. Cytotoxic effects of different concentrations of TiO2 NPs in A375 cells. Cells were treated with 1 to 100 μg/mL concentrations of TiO2 NPs for 24 hours and cytotoxicity was studied by the MTT assay. Data are means ± SD. Star indicates statistically significant data (P < 0.05). To determine whether the autophagy process may be also induced after treatment with NPs, the AVO formation test was examined. The results showed that all concentrations of NPs could induce AVO formation yet in a dose - dependent manner (Figure 4). Indeed, the formation of AVOs at concentrations of 100 μg/mL was higher than 1 and 10 μg/mL of NPs. In addition, the researchers evaluated the expression levels of Beclin - 1 (Atg6) as one of the well - known autophagy markers (18). The expression level of this protein increased during initial phases of autophagy. The results showed that 100 μg/mL of NP significantly increased expression levels of Atg6 (Figure 5), which further confirmed that formation of AVOs may be related to induction of autophagy. Figure 4. 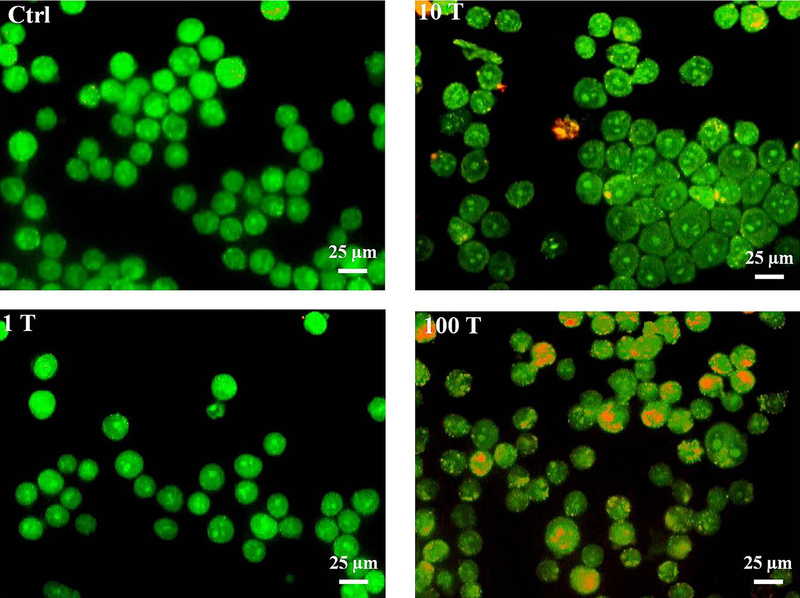 Effects of TiO2 NPs on detection of acidic vesicular organelles and autophagy in A375 cells. Cells were treated with different concentrations of NPs (1, 10 and 100 μg/mL), then harvested and stained with AO for 24 hours. The content of acidic vacuoles (red dots) was evaluated by fluorescence microscopy (magnification 32X). Figure 5. Effects of TiO2 NPs on the expression level of Atg6. The cells were treated with 100 μg/mL of NPs for 24 hours, the expression levels of Atg6 were evaluated by q - PCR, and the results were presented as fold change of control cells. Recent evidence demonstrates that the incidence of melanoma is increasing worldwide and despite this, a reliable therapeutic option has yet to be described. Indeed, the inability of conventional treatment strategies in skin cancer declares a need for finding more effective therapeutic strategies (19, 20). Nowadays, the application of NPs in the diagnosis and treatment of cancer has attracted numerous researchers. The main reason is that NPs can easily penetrate into cells and possess finely - tunable and theragnosis (both diagnosis and therapy) capabilities (21). Recently, several NP - based anticancer agents, such as metal oxides, graphene, carbons, and various polymers have been proposed for nanomedicine application (22). In particular, TiO2 NPs, alone or in combination with light irradiation, have been proposed as potent anti - cancer agents by a mechanism that mainly relies on ROS generation (23, 24). In addition, recent reports revealed that TiO2 NPs have potent cell death ability mostly through autophagy and apoptosis induction (25). A large number of studies have shown that TiO2 NPs can induce autophagy in different cell lines (7), including A375 (26), breast epithelial cells (27), HeLa, KB, and QGY (28) cells. In parallel with these reports, the researchers showed that TiO2 NPs had no effect on cell viability at low concentrations, while high concentration (100 µg/mL) of TiO2 NPs clearly induced growth inhibition and cell death in A375 cell lines (Figures 2 and 3). These results are in agreement with those obtained by Zhang et al., who demonstrated that TiO2 NPs had no remarkable effect on the viability of hepatocarcinoma cells at low concentrations (9). Also, it has been reported that TiO2 NPs induced growth inhibition and cell death in a time- and dose - dependent manner in the MCF - 7 cell line, where cell death was mostly observed at high concentrations of NP (29). The most interesting finding of this paper was that different doses of TiO2 (10 and 100 µg/mL) induced autophagy in A375 cells (Figure 4). According to Figure 4, autophagy was increased after exposure to TiO2 NPs in a concentration - dependent manner. Thus, the researchers observed an autophagic effect under both toxic and non - cytotoxic conditions of NP treatment. In other words, the current results suggested that autophagy induction can lead to survival or cell death in the system. This can be related to different levels of autophagy induction by different concentrations of NP (Figure 4). Many reports suggest that autophagy can exert both survival and cell death functions, depending on the level of its activation (30). Also, as recently reported, low and high concentrations of NP may increase AVO formation through autophagy flux or autophagy blockage, respectively (7). The current results regarding different outcomes induced by different concentrations of TiO2 NPs, seem to be similar to these reports. Nevertheless, the autophagic potential of TiO2 NPs may have therapeutic benefits for treatment of melanoma. Further studies are needed to address the mechanism of autophagy induction by TiO2 NPs and also effects of other physiochemical properties. The current data showed that low concentrations of well - dispersed TiO2 NPs (1 - 10 µg/mL) are inert yet high doses induce cell death in A375 cells. Also, TiO2 NPs at both low and high concentrations evoked an autophagic response that leads to growth arrest or cell death, respectively. Thus, TiO2 NPs can induce both cytostatic and cytotoxic autophagic responses, depending on concentration, suggesting that well - dispersed forms of this NP may be proposed as autophagy - modulating agent for cancer therapy, particularly melanoma. The authors deeply appreciate the National Institute for Genetic Engineering and Biotechnology for financial support of this work. Marveh Rahmati is thankful of the Cancer Biology Research Center of Tehran University of Medical Sciences grants. Funding/Support: Mohammad Amin Moosavi was supported by the National Institute for Medical Research Development (NIMAD) and National Research Institute for Science Policy (NRISP). 1. Garbe C, Eigentler TK, Keilholz U, Hauschild A, Kirkwood JM. Systematic review of medical treatment in melanoma: current status and future prospects. Oncologist. 2011;16(1):5-24. doi: 10.1634/theoncologist.2010-0190. [PubMed: 21212434]. [PubMed Central: PMC3228046]. 2. Berciano-Guerrero MA, Montesa-Pino A, Castaneda-Penalvo G, Munoz-Fernandez L, Rodriguez-Flores J. Nanoparticles in melanoma. Curr Med Chem. 2014;21(32):3701-16. [PubMed: 25039783]. 3. Choi AM, Ryter SW, Levine B. Autophagy in human health and disease. N Engl J Med. 2013;368(7):651-62. doi: 10.1056/NEJMra1205406. [PubMed: 23406030]. 4. Chen N, Debnath J. Autophagy and tumorigenesis. FEBS Lett. 2010;584(7):1427-35. doi: 10.1016/j.febslet.2009.12.034. [PubMed: 20035753]. [PubMed Central: PMC2843775]. 5. Mokarram P, Albokashy M, Zarghooni M, Moosavi MA, Sepehri Z, Chen QM, et al. New frontiers in the treatment of colorectal cancer: Autophagy and the unfolded protein response as promising targets. Autophagy. 2017;13(5):781-819. doi: 10.1080/15548627.2017.1290751. [PubMed: 28358273]. [PubMed Central: PMC5446063]. 6. Salata O. Applications of nanoparticles in biology and medicine. J Nanobiotechnology. 2004;2(1):3. doi: 10.1186/1477-3155-2-3. [PubMed: 15119954]. [PubMed Central: PMC419715]. 7. Lopes VR, Loitto V, Audinot JN, Bayat N, Gutleb AC, Cristobal S. Dose-dependent autophagic effect of titanium dioxide nanoparticles in human HaCaT cells at non-cytotoxic levels. J Nanobiotechnology. 2016;14:22. doi: 10.1186/s12951-016-0174-0. [PubMed: 27001369]. [PubMed Central: PMC4802894]. 8. Rezaei B, Mosaddeghi H, editors. Applications of Titanium Dioxide Nanocoating. Nano-Technology in Environments Conference. 2006. 9. Zhang H, Shan Y, Dong L. A comparison of TiO2 and ZnO nanoparticles as photosensitizers in photodynamic therapy for cancer. J Biomed Nanotechnol. 2014;10(8):1450-7. [PubMed: 25016645]. 10. Zhu Y, Eaton JW, Li C. Titanium dioxide (TiO2) nanoparticles preferentially induce cell death in transformed cells in a Bak/Bax-independent fashion. PLoS One. 2012;7(11). e50607. doi: 10.1371/journal.pone.0050607. [PubMed: 23185639]. [PubMed Central: PMC3503962]. 11. Chen HW, Su SF, Chien CT, Lin WH, Yu SL, Chou CC, et al. Titanium dioxide nanoparticles induce emphysema-like lung injury in mice. FASEB J. 2006;20(13):2393-5. doi: 10.1096/fj.06-6485fje. [PubMed: 17023518]. 12. Pujalte I, Dieme D, Haddad S, Serventi AM, Bouchard M. Toxicokinetics of titanium dioxide (TiO2) nanoparticles after inhalation in rats. Toxicol Lett. 2017;265:77-85. doi: 10.1016/j.toxlet.2016.11.014. [PubMed: 27884615]. 13. Sun Q, Ishii T, Kanehira K, Sato T, Taniguchi A. Uniform TiO2 nanoparticles induce apoptosis in epithelial cell lines in a size-dependent manner. Biomater Sci. 2017;5(5):1014-21. doi: 10.1039/c6bm00946h. [PubMed: 28338134]. 14. Moosavi MA, Sharifi M, Ghafary SM, Mohammadalipour Z, Khataee A, Rahmati M, et al. Photodynamic N-TiO2 Nanoparticle Treatment Induces Controlled ROS-mediated Autophagy and Terminal Differentiation of Leukemia Cells. Sci Rep. 2016;6:34413. doi: 10.1038/srep34413. [PubMed: 27698385]. [PubMed Central: PMC5048164]. 15. Zhang X, Yin H, Li Z, Zhang T, Yang Z. Nano-TiO2 induces autophagy to protect against cell death through antioxidative mechanism in podocytes. Cell Biol Toxicol. 2016;32(6):513-27. doi: 10.1007/s10565-016-9352-y. [PubMed: 27430495]. 16. Yu KN, Chang SH, Park SJ, Lim J, Lee J, Yoon TJ, et al. Titanium Dioxide Nanoparticles Induce Endoplasmic Reticulum Stress-Mediated Autophagic Cell Death via Mitochondria-Associated Endoplasmic Reticulum Membrane Disruption in Normal Lung Cells. PLoS One. 2015;10(6). e0131208. doi: 10.1371/journal.pone.0131208. [PubMed: 26121477]. [PubMed Central: PMC4485469]. 17. Ahmadi AH, Moosavi MA, Hosseinpour Feizi MA. [The inductive effect of boric acid on growth inhibition and differentiating changes of human chronic myeloid leukemia K562 cell line]. Arak Med Univ J. 2010;13(3):1-11. Persian. 18. Fakhimahmadi A, Nazmi F, Rahmati M, Bonab NM, Hashemi M, Moosavi MA. Nucleostemin silencing induces differentiation and potentiates all-trans-retinoic acid effects in human acute promyelocytic leukemia NB4 cells via autophagy. Leuk Res. 2017;63:15-21. doi: 10.1016/j.leukres.2017.10.007. [PubMed: 29096331]. 19. Rigel DS, Carucci JA. Malignant melanoma: prevention, early detection, and treatment in the 21st century. CA Cancer J Clin. 2000;50(4):215-36. quiz 237-40. [PubMed: 10986965]. 20. Moan JE, Baturaite Z, Dahlback A, Porojnicu AC. Ultraviolet radiation and cutaneous malignant melanoma. Adv Exp Med Biol. 2014;810:359-74. [PubMed: 25207376]. 21. Cadman C. Titanium Dioxide Nanoparticles for Photodynamic Therapy. University of Manchester; 2013. 22. Xu P, Wang R, Ouyang J, Chen B. A new strategy for TiO2 whiskers mediated multi-mode cancer treatment. Nanoscale Res Lett. 2015;10:94. doi: 10.1186/s11671-015-0796-4. [PubMed: 25852390]. [PubMed Central: PMC4385221]. 23. Khalili Fard J, Jafari S, Eghbal MA. A Review of Molecular Mechanisms Involved in Toxicity of Nanoparticles. Adv Pharm Bull. 2015;5(4):447-54. doi: 10.15171/apb.2015.061. [PubMed: 26819915]. [PubMed Central: PMC4729339]. 24. Sohaebuddin SK. Mechanism of nanoparticle and nanotube-induced cell death. The University of Texas at Arlington; 2008. 25. Thevenot PT. Functionalized nanoparticles for the selective killing of cancer cells. The University of Texas at Arlington; 2007. 26. Seo JW, Chung H, Kim MY, Lee J, Choi IH, Cheon J. Development of water-soluble single-crystalline TiO2 nanoparticles for photocatalytic cancer-cell treatment. Small. 2007;3(5):850-3. doi: 10.1002/smll.200600488. [PubMed: 17385208]. 27. Lagopati N, Kitsiou PV, Kontos AI, Venieratos P, Kotsopoulou E, Kontos AG, et al. 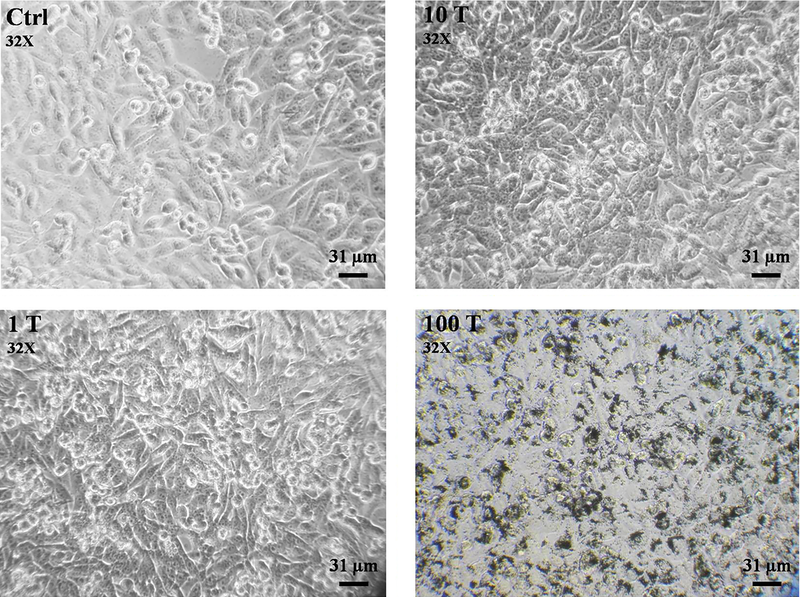 Photo-induced treatment of breast epithelial cancer cells using nanostructured titanium dioxide solution. J Photochem Photobiol Chem. 2010;214(2-3):215-23. doi: 10.1016/j.jphotochem.2010.06.031. 28. Li Z, Pan X, Wang T, Wang PN, Chen JY, Mi L. Comparison of the killing effects between nitrogen-doped and pure TiO2 on HeLa cells with visible light irradiation. Nanoscale Res Lett. 2013;8(1):96. doi: 10.1186/1556-276X-8-96. [PubMed: 23433090]. [PubMed Central: PMC3599500]. 29. Lotfian H, Nemati F. Cytotoxic effect of tio2 nanoparticles on breast cancer cell line (MCF-7). IIOAB J. 2016;7:219-24. 30. Cheng Y, Ren X, Hait WN, Yang JM. Therapeutic targeting of autophagy in disease: biology and pharmacology. Pharmacol Rev. 2013;65(4):1162-97. doi: 10.1124/pr.112.007120. [PubMed: 23943849]. [PubMed Central: PMC3799234].